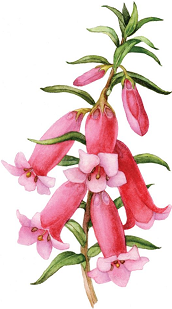 APS Mornington Peninsula Inc is a group of plant lovers who enjoy meeting with like-minded people to share their enthusiasm and to increase their knowledge about growing Australian plants on the Mornington Peninsula, south of Melbourne. Members live from Frankston down to Rye, across the Peninsula from Port Phillip Bay to Westernport Bay. Our gardens range in size from small courtyard to hectares, or no garden at all. Some of us are beginners, some are more experienced and there are a handful of specialists. The general pattern of our activities is for bi-monthly meetings on the 3rd Tuesday of the month, alternating with excursions on the 3rd Saturday of the month, although we flex this a bit to take advantage of the main flowering season, plus weeding and planting at Devilbend Reserve. Meetings are all held in the Benton Square Community Centre, 145 Bentons Rd, Mornington, Victoria 3931 (Melways 145 G6). The start times alternate between evening (7:15pm for 7:30pm start) and afternoon (2:15pm for 2:30pm start). Most meetings involve a guest speaker with specific expertise, followed by “show and tell” Plant Table and a convivial supper/afternoon tea. Excursions usually start at 10:30am. 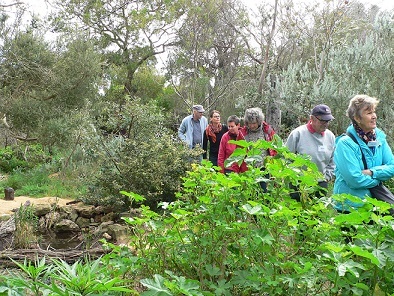 They include short guided walks in bushland reserves to learn about the variety of vegetation on the Peninsula, visits to members’ gardens and special gardens off the Peninsula, and bus trips take us further afield.